Some days ago I have written a post about Gravatar. How to get it? What are the benefits and more? But the question arises as if people want to disable Gravatar then how to do that? How to remove Gravatar From WordPress? Whenever people come to know about any new thing to use then they appeal to know about its removal. What is Gravatar and how to hide Gravatar? Let me tell you that Gravatar is the service provided to you for giving a unique identity to you by attaching any image with your e-mail. If you have your Gravatar then whenever you comment at any blog then your image will appear with your comment. It’s always recommended that bloggers should get their own Gravatar by visiting their official website. Now the point comes as how to hide Gravatar in WordPress? Don’t panic, it’s much more simple than taking a bite. Scroll the bar downward and you can see Avatars section. There are basically two options to check and uncheck. 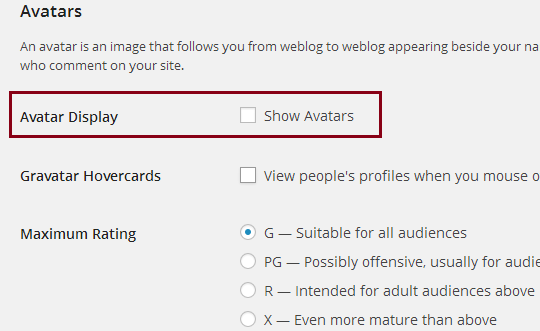 If you want to disable Gravatar then you should uncheck the box in front of “Avatar Display“. Now you are done. Your wish to hide Gravatar from WordPress has fulfilled. You will not see any Gravatar in your comment section. Your Gravatar in the WordPress admin bar will also get disabled and you will see default Gravatar. There will not be any Gravatar in your admin area. How to choose Avatar in WordPress? You can see under there are many icons which are termed as Avatars. Though bloggers are advised not to accept any comment which is submitted without Gravatar but still it’s the matter of choice to accept it. 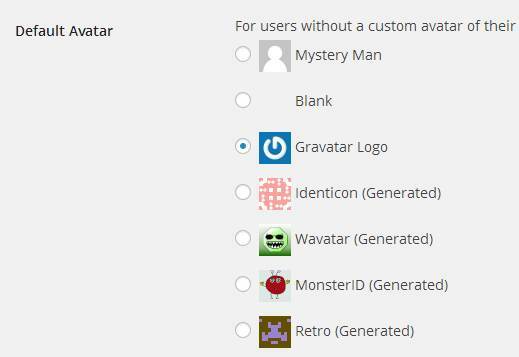 If you want to show any icon in of place blank face then you can choose a default Avatar which can be shown if any user doesn’t have Gravatar then the icon you use will be shown in place of simple face space which is called “Mystery Man”. You can select any of the icon from the list to show. After selecting you have to click on the save changes option downward and all the changes you have done will get saved. Most of the bloggers, like to accept comments on their blog with the users which have their own Gravatar but still if you don’t want to disable Gravatar then you can do it easily as discussed above. Yeah, off course people need to have their picture with their comments. It helps in making online brand. But you there may be some people who may not want to show Gravatar. They can use this tutorial. You are always coming up with nifty things to do! Removing a gravatar is something I didn’t know I could do. I can see how this comes in handy. Personally, I like to see a picture of a person on my blog. When people aren’t using their personal pictures, it makes me go Hmmm. I know there are some that use their logo, and that’s OK. But I must have a personal picture in order to “trust” them. I do have some clients that are new and setting up their blogs. They have that “mystery man” and I do make an exception but just for a short time. I urge them to use their personal picture, or else, I cannot accept it. It’s all about that trust factor! As I have discussed in my post related to Gravatar it’s important to have a Gravatar to build online brand. Yeah, off course we all like to have the readers their image so that we can trust them by not considering them as spam. But as you know some people like to ask as how to undo it? And here is my answer in this post. I don’t understand why someone will prefer to disable unless want to to anonymous. I agree to what Maxwell said, a picture of the reader who is adding a comment creates trust. I also agree with you and Max but some people have asked me to remove their Gravatar so I had to write this post. Great tutorial you have here Ravi, i am glad i came around. i actually followed your link from Angela’s blog. I have written the post for adding a Gravatar few days ago and this post is for those who want to undo it. What a wonderful post to help people learn to do something that could potentially be very frustrating. Great post idea originally because I do not like to see the ‘Mystery Man’ or whatever depicts the user who has not added their personal picture yet. I do not fault them if they are new because it is a new skill they must learn to get a profile pic up, but they should put attention to it soon after, I agree. I like the fact that you use a screen shot as so many people are visual learners and can benefit from seeing an example of what you’re talking about. I think it’s good to have a Gravatar and show your face, most definitely. I appreciate you bringing this topic up as many beginner bloggers can absolutely benefit. Most of beginners don’t have proper idea about having a Gravatar or removing it from WordPress. They need to know more about it. It’s always recommended to have a image with the comments because only then comments can be accepted. Most of bloggers don’t accept comments which are put without Gravatar. Having a Gravatar is necessary to build an online branding. People should use same image online so that people can know the face because it’s easy to recognize face than name. I prefer people to have a Gravatar, but if they have left a meaningful comment on my blog, I wont not publish it just for lacking one. I do think however that if a blogger is serious about moving forward then they need to have one and show their face. It helps to build you online profile and a “real” face is preferred! On my blogs, I set the Gravatar logo as default if a commentor doesn’t have a Gravatar. I think it looks the nicest out of the bunch. You are right people need to have their image as their Gravatar so that bloggers can recognize them as real one. People who comment without Gravatar may be considered as spam droppers. Setting up your logo is a good choice. Though people go to Gravatar to get recognized by everything they post anywhere but I have seen people who don’t want to have a picture of their own. If you ask me, people with no gravatar image looks like a spammer(considering their presence). And if someone will comment on my blog without any Gravatar image and the comment is not useful I won’t approve that for sure. One need to be visible to get noticed. And its good to see you sharing a simple way to make changes and may be its sometimes necessary to do so. I agree with you that Gravatar of any people is the sign for reality. Well I guess there are those people who maybe don’t want them showing on their blogs. Gosh, I sure hope I never meet any of them. Now one thing I’ll ask you but I don’t know if you know the answer to it. Of course now I don’t accept any comments from people who do not have a gravatar set up so I never see them anymore. But before that I had checked the settings so that instead of the gray faceless person that it would be a monster instead if they didn’t have theirs set up. I just thought it was cuter too look at ya know! It never worked, it was always either a gray faceless person or the regular gravatar symbol. So do you think they had that set up that way maybe? Like in their gravatar account? I tell you it use to drive me nuts. So now of course it’s just out of curiosity should you happen to know but since I never see them anymore I guess it really doesn’t matter. Thanks though for this great tutorial. You did a great job with this Ravi. Hey, have a great week my friend. You see whenever people comment at any blog without Gravatar then the faceless image which is termed as Mistery Man shows with the comment because there is no image attached to their e-mail. Many bloggers adjust their setting as if anyone comment at their blog without their image then Gravatar symbol will appear in place of Mistery Man. As you can see in the screenshot in the post that you have some options to choose, some icons which you want to show in place of that faceless guy. It is possible that someone may set Gravatar symbol or any other icon shown above as their Gravatar but real people don’t do it. Non-spammers don’t get afraid to show their image. It’s the matter of making connections. I have never met anyone who just set any Gravatar icon. Most of people don’t have Gravatar and I have adjusted to show Gravatar symbol. You may also set any other icon. Thanks for your remarkable comment. Speaking of which, I always keep telling the ‘faceless’ commenters to come next time with a Gravatar, so this was a nice change, though I wonder why would anyone want to remove a Gravatar from their blogs. Perhaps for hiding their identity or other reasons. For me, it always makes sense to have a face showing, the real identity of a person is seen that ways as best. But yes, sometimes people don’t know how they can get a Gravatar, so your post (earlier one and this) can help in getting one or removing it too. Most of beginners don’t know about Gravatar and it’s settings. It’s necessary for them to have some idea about having a Gravatar or to remove it. If we accept any comment from a person without any Gravatar then by default Mistery Man will be shown at our blog so it’s important for us to set up any other icon provided by WordPress here. It looks good instead of showing faceless guy. Lovely post.. I would prefer to stay visible by appearance as it gives more recognization. Yeah tjanks for the tutorial if in need I have to remove the gravatar then surely your post is a first recommendation. Keep sharing nice post and have a nice week ahead. Every blogger like to have real people at their blog and commenters without Gravatar are considered as spammers. But somehow if bloggers accept any comment which doesn’t have any image then to make it look better they set any default icon. Thanks for coming any dropping your input. Thanks for sharing a very important and equally easy tip to enhance the brand image of your blog. It also depends upon niche of your blog. The audience of tech related niche have gravatar id. On the contrary those with non-techie niches like natural healing and green living many readers don’t have registered gravatar image. For this purpose you pointed the best solution that is workable without any risk or doubt. Thanks a lot for sharing another very simple and easy understand but very very valuable post. You are right sometime bloggers set the Gravatar for the commenters who don’t have their own to show at their blog according to the niche of the blog. Wow, its really so tricky guide. We can easily remove gravatar from wordpress blogs. Off course it’s good to have a Gravatar but some people desire to know to undo their step which they have taken in adding their image as their Gravatar. I can appreciate that you’re showing people how to remove the gravatar from their blogs but I just see the logic in why someone would want to do so. I mean, I’ve seen people that have the mystery person there for every single person that comments but it just looks empty to me. I prefer to be able to recognize people by their gravatars. But hey, that’s just me. Nonetheless, you wrote a great tutorial here. There is no doubt that most of bloggers want to show Gravatar as it’s show their real value. People without Gravatar are considered as spammers. In my opinion too people should show their image so that others can know them well. But there are many who don’t like to show their image and remove their Gravatar.